I hope everybody had a great week and enjoying their weekend! We are still in the states and now in Des Moines visiting our home church, family and friends. It has been good so far… but I am soooo ready to get back home to my kefir and lacto-ferments!!!! My body misses them a lot SO BAD… traveling isn’t easy because we are out of our normal routine with food and life. We tend to eat fairly simple at home… more now then when we were living in Costa Rica. Because of our clean diet… eating foods that we are not used to eating really wears us out. Even food that are “organic” and “healthy” can make us a little queasy because of ingredients that have not been a normal part of our diet over the last several months. Some of you might be wondering if we buy our own food… yes!! we typical stop by Trader Joe’s or/and a local farmer’s market to pick up food to snack & cook whenever we can. Some of the time we are eating at friends’ houses or eating out with friends… which makes it hard on us because we aren’t always in control of what we eat. We really make an effort to buy raw milk, cheeses and kombucha to help us along… but it is hard to find raw, plain kefir as the ones in the stores are pasteurized and not very good. I have kefir and lacto-ferments everyday at home… that’s why I miss it so much! I know my hubby and girls do too!! I keep reminding myself… just a few more days and we will be home! Just a few more… LOL!!!! Don’t get me wrong… we do enjoy our visits to the states, but it does take a lot out of us! I’m sure most of you can understand. When it comes to real food… the best place to eat is in the comforts of your home. Right?! 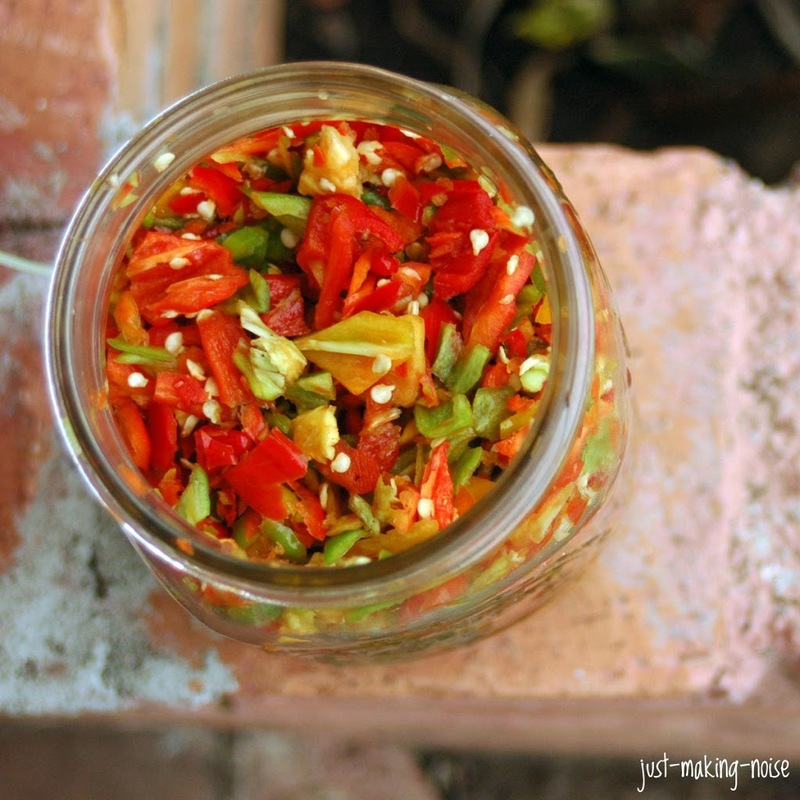 Now I’ve got another lacto-fermented recipe for all those who LOVE hot, spicy peppers. The cayenne really give a huge kick in the mouth with their fire… especially when they are fermented! I just made a jar of pickled jalapenos which I’ll have to share later, but we are still finishing up the pickled cayenne which I made over 8 months ago!!! Yeah! Crazy, huh? I love it and the flavor is wonderful… more so now then when I first made these guys. They are crazy spicy and will make you sweat if you eat too much… so… go easy first to see how much you can handle. They are addicting! My hubby and daddio LOVE them with almost everything. The juice is fantastic for spicy up stews, soups and anything else you want to add some kick to! Usually 2 Tbsp is more than enough for a big pot of chili to give it some great heat. Save this recipe for this summer! I know many of you wonder what to do with all your extra hot peppers… this is a fantastic way to improve the flavor, increase nutritional value, store for the winter months and give away to your friends & family! I love how bright the colors come out after they are done fermenting… a great burst of summer right in your fridge during the dark, cold winter is a beautiful sight, yes?! Plus, I remember reading somewhere that hot peppers often prevent sickness and have the highest source of vitamin C… awesome! Wearing gloves, wash & sliced peppers. 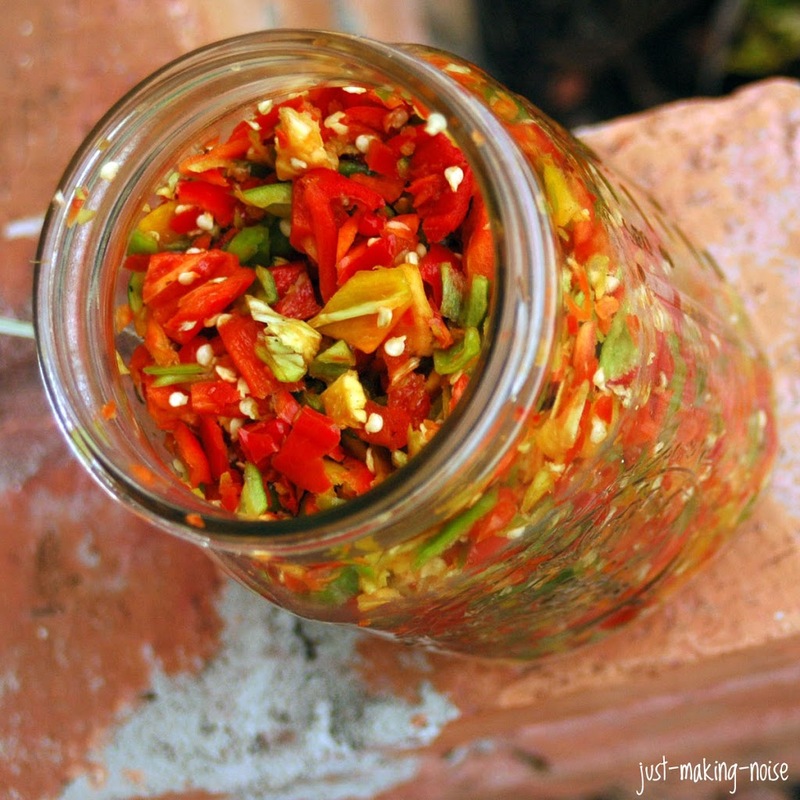 Add sliced peppers to a quart jar and lightly press down to add more if needed. Add the chopped garlic on top. Mix sea salt and whey. Pour over peppers and add filtered water till peppers are covered. Make sure to leave at least 1 inch of space between the peppers and the lid. Cover tightly with an airlock or regular sealed lid. Leave in room temperature and out of light for 2-3 days. It’s ready when you hear a fizzy sound and see bubbles when opening the jar. Store in a cool place and out of light (pantry, basement or fridge). Will keep for up to 6 months (but I’ve had it last longer than that and it got spicier!). If you haven’t yet… please read how you can benefit from lacto-fermenting your food! Also, this post is part of Fight Back Fridays @ Food Renegade. I;ll be very excited to make this as a gift to my brother and my father-in-law! Did you make this here in the states, or did you have this post just waiting for us? There’s no place like home eating home-cooked meals. I think it’s time for me to make another recipe of lacto-fermented foods. Thanks for the recipe. Wow, what a great idea. I had never considered lacto-fermenting peppers before. I’ll need to copy this one down for pepper days ahead. Shalom, I just came across your site when I linked to a recipe, you were on this lady’s blog roll. How refreshing your site is. These are gorgeous and I can’t wait to make some of my own! I’ve just started Lacto-fermenting recently and am so excited to do some peppers! Yum! I’m sure this has such an incredible flavor! I see your peppers are different colors, are they all cayenne at different stages of ripe or are there different mixture of hot peppers in there? I am growing a bunch of peppers this year and when I have too many this would be great!! I probably would have to mix the types of peppers to get a jar full however. Have you ever done that? Thanks for all your great info on Lacto-Fermentation! I’ve used you as a helpful reference on my blog! I’m just getting started with raw cultured veg. Thinking about you and missing your posts. Why the filtered water? Can I just use my tap water? We have a well. Just hoping you know the answer. LOL – I was visiting family yesterday and went looking in the fridge for something to drink and realized there was NOTHING there that I would normally consume. Switching to real food is a journey, and incidents like that make me realize how far we’ve traveled. Fantastic for spicy up stews, soups and anything else you want to add some kick to. I just recently stumbled on it and feel somewhat of a kindred spirit after reading some of your posts.